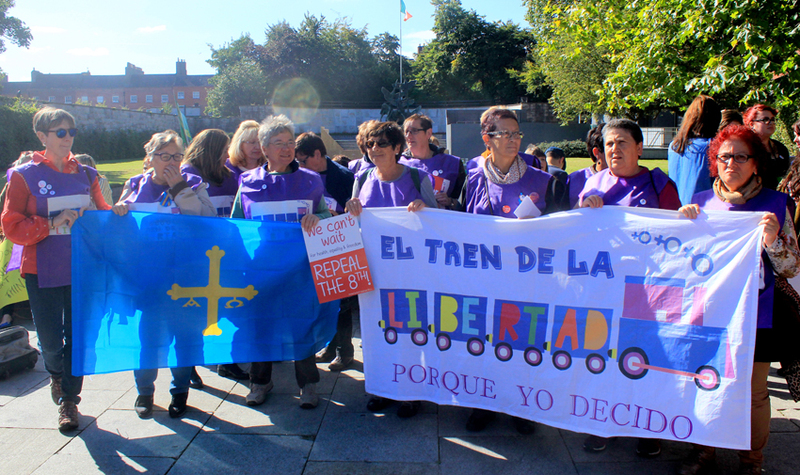 The Abortion Rights Campaign were delighted to welcome 18 pro-choice activists visiting us from Spain to participate in the 4th Annual March for Choice. During our visit to the European Parliament last February, we were lucky to meet these inspiring women and they readily accepted invitations to join us for our march.When the conservative People’s Party (Partido Popular) in Spain attempted to bring in regressive reforms to abortion law in December 2013, the grassroots took action. Two collectives, Barredos Women for Equality (Mujeres por la Igualdad de Barredos) and The Godmothers‘ Feminist Salon (Tertulia Feminista Les Comadres) came together for this action. Starting with meetings in the flower shop of one of their members, this group of women travelled by train to the Spanish capital of Madrid from the Asturian city of Gijón, in the North of Spain. These women were responsible for the protest and gave it its name: The Freedom Train (El Tren de la libertad). In Madrid, they were accompanied by a multitude of other feminist organisations, politicians, trade unions, supporters and members of the public for a colourful protest. They all walked together to the Spanish Parliament, where they handed in a petition. Their rousing statement called I decide (Yo decido) was given to the Prime Minister and his cabinet, demanding the proposed bill be thrown out. Due in part to their magnificent efforts, the bill was not put into law and women in Spain have no new barriers to access the abortion services they need. We are so grateful to have international activists such as these inspirational women march with us.